Our regularly scheduled forecast update for Wednesday slipped through the cracks. The FiveThirtyEight forecast was not much changed based on Wednesday’s polls, however, with Barack Obama’s chances of winning the Electoral College increasing incrementally to 65.7 percent from 64.8 percent. We’ll catch up with Thursday’s polls with the next update. In the meantime, I’m going to focus on one particular survey, the Gallup national tracking poll. Our database contains records from 136 distinct pollsters that have released at least one state or national survey at some point in this election cycle. Of those, 53 are active enough to have issued at least one survey since Oct. 1. Let me walk you through the rules for how the FiveThirtyEight model weighs the Gallup poll relative to all the other information it accounts for. This explanation will be modestly technical — you may want to skip ahead to the next section if you aren’t concerned with these details. 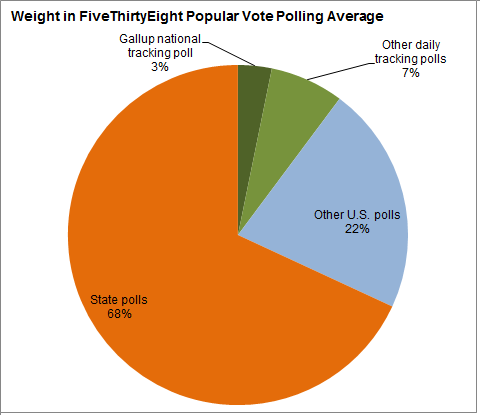 Different types of polls are relatively more and relatively less useful for these purposes. Because national tracking polls like Gallup are published every day, they are useful for the trend part of the calculation, measuring the change in the race against a constant baseline. Each poll receives a weight in the FiveThirtyEight trend-line calculation based on its sample size and its pollster rating. The model accounts for the fact that tracking polls use an overlapping set of interviews. A three-day tracking poll might consist of interviews conducted on Monday, Tuesday and Wednesday, for instance. When the polling firm issues its next release of the survey, a fresh set of interviews from Thursday will replace the ones from Monday in the sample. Thus, we reduce the weight assigned to each edition of a tracking poll to avoid counting the same interviews multiple times. Even so, there are quite a few interviews conducted by a tracking poll over the course of a week — about 3,000 per week in the Gallup national tracking poll, for instance. Of the daily tracking polls, the Gallup survey receives the largest weight in the trend-line calculation. It uses a larger sample size than most other polls, and it has a methodology that includes calls to cellphone voters. On the other hand, the pollster ratings are also based in part on past accuracy, and Gallup’s performance is middling in that department. It mostly gets a lot of weight by comparison, since the tracking surveys are a mediocre group on the whole. The trend-line adjustment also looks at other national polls when they are published, like the New York Times/CBS News or the Wall Street Journal/NBC News surveys. This is a high-quality group of polls; the disadvantage is that they are published only occasionally. State polls are also useful for determining the overall trend in the race. In this case, the advantage is the abundance and diversity of data: there might be 10 or 20 state polls published on a typical day, often from 5 or 10 polling firms. 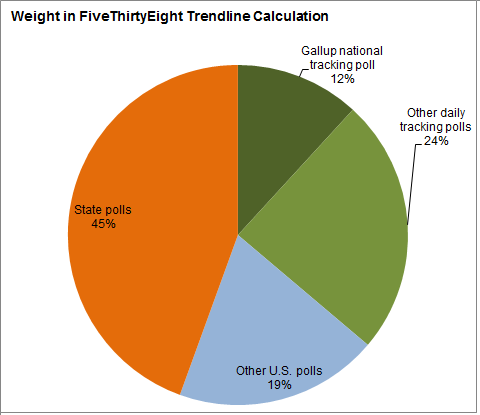 The trend-line calculation applies a 50 percent penalty to the weight assigned to state polls because trends in any one state could be an aberration. However, the states generally rise and fall together when there is a shift in the national climate — and if one candidate makes an especially large gain in one state, it must necessarily be counterbalanced by others in which it is below average. The relative amount of weight assigned to each type of poll is fluid rather than fixed, and depends on the overall volume of data. On days when a large number of state polls is published but few national ones, they will generally be the more useful source for making inferences about the trend in the race. But on average since Oct. 1, the Gallup national tracking poll has accounted for 12 percent of the information that the model uses to calculate the trend line. The other daily tracking polls, collectively, have accounted for 24 percent of the data, and the occasionally published national polls for 19 percent. Finally, the state polls account for about 45 percent of the data used to calculate the trend-line adjustment. Thus, even though the Gallup national tracking poll is more influential than any other individual poll series in the FiveThirtyEight trend-line calculation, it still accounts for only about 12 percent of it. It can very easily be outweighed by the other polls if they are in disagreement with it. to take some kind of average of them. The way the polls are employed to calculate the average is a little different than in calculating the trend line. Our research suggests, for instance, that state polls, rather than national polls, often provide a better estimate of the national popular vote, in addition to the Electoral College. Over all, the Gallup daily tracking poll accounts for only about 3 percent of the weight in this stage of the calculation. The national tracking polls collectively, including Gallup, account for only about 10 percent of it. Most of the weight, instead, is given to the state polls. This is, obviously, a rather detailed answer to the seemingly simple question of how much information is provided by the Gallup national tracking poll, as opposed to all the other state and national surveys. Nevertheless, any rigorous attempt to consider the value of the Gallup poll would probably get you to something of the same answer. Perhaps the Gallup poll accounts for 5 or 10 percent of the information that an election analyst should evaluate on a given day. In 2008, the Gallup poll put Mr. Obama 11 points ahead of John McCain on the eve of that November’s election. That was tied for Mr. Obama’s largest projected margin of victory among any of the 15 or so national polls that were released just in advance of the election. The average of polls put Mr. Obama up by about seven points. In 2010, Gallup put Republicans ahead by 15 points on the national Congressional ballot, higher than other polling firms, which put Republicans an average of eight or nine points ahead instead. In fact, Republicans won the popular vote for the United States House by about seven percentage points — fairly close to the average of polls, but representing another big miss for Gallup. Apart from Gallup’s final poll not having been especially accurate in recent years, it has often been a wild ride to get there. Their polls, for whatever reason, have often found implausibly large swings in the race. Then in October 2000, Gallup showed a 14-point swing toward Mr. Bush over the course of a few days, and had him ahead by 13 points on Oct. 27 — just 10 days before an election that ended in a virtual tie. In 1996, Gallup had Bill Clinton’s margin over Bob Dole increasing to 25 points from nine points over the course of four days. After the Republican convention in 2008, Gallup had John McCain leading Mr. Obama by as many as 10 points among likely voters. Although some other polls also had Mr. McCain pulling ahead in the race, no other polling firm ever gave him larger than a four-point lead. Even its registered voter numbers can be volatile, however. In early September of this year, after the Democratic convention, Gallup had Mr. Obama’s lead among registered voters going from seven points to zero points over the course of a week — and then reverting to six points just as quickly. Most other polling firms showed a roughly steady race during this time period. Because Gallup’s polls usually take large sample sizes, statistical variance alone probably cannot account these sorts of shifts. It seems to be an endemic issue with their methodology. A version of this article appears in print on 10/20/2012, on page A12 of the NewYork edition with the headline: In National Polling, It’s Gallup vs. the Rest.